The Oakland Unified School District was moving ahead with a proposal to place a charter school with middle age children on the McClymonds High School campus in West Oakland. But after parents and community members came out in force to a meeting last week to object to the co-location plan – some pledging they would go to jail before letting their campus be taken over – the charter school quickly withdrew its request for space on the McClymonds campus. Valerie Goode, deputy chief of OUSD communications and public affairs, told the Post this week that the deal was off, that the American Indian Models Schools (AIMS) charter school organization had withdrawn its request for facilities at McClymonds. “As of March 1, the charter school requesting facility space at McClymonds has withdrawn. Therefore, there is no longer any charter school request for facility space that will be at McClymonds,” said Goode. “The district will not be co-locating a charter school at McClymonds for the 2017-18 school year,” she said. Sylvester Hodges, a former school board member and president of the McClymonds alumni centennial committee, AIMS had realized that there was no way their school would open at McClymonds. “They got the message. They were picking on the wrong high school, no doubt about it,” said Hodges. “There are a number of us who are willing to go to jail if necessary,” said Hodges. “It’s a great school, but they are not welcome. They are not going to be put in a private school in with the public school. “If they get their head in the door, they will take over,” he said. The AIMS charter school office did not respond to the Post’s questions. At a meeting in a classroom at McClymonds last Thursday evening, a district representative came out to explain that the American Indian Models Schools, made up of several charter schools in Oakland, was requesting space for a middle school at McClymonds. The representative was there to explain that the school, based on enrollment and square footage of space at the school, would have to make room for the charter. Under a state law called Prop. 39, the district says it is required to give the space to charters that request it. The turnout was huge. Members of the McClymonds community stood along the walls and listened from outside in the hallway, and they quickly took over the meeting. “They were there to express their displeasure with the Oakland school board that has done nothing to improve that school since 2007,” said “Coach” Ben Tapscott, a school activist who helped form the New McClymonds Committee in 2011. “People were saying, ‘We don’t want any damned charter school over there. We want our school fixed,’” he said. According to Tapscott, the district has closed five schools in West Oakland, forcing parents to send to send their children to other parts of the city to attend middle school. 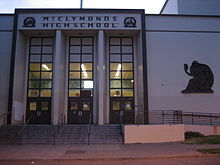 With no middle schools feeding into McClymonds High, enrollment has fallen drastically. Despite these obstacles, enrollment is gradually rebuilding, said Tapscott. Trish Gorham, president of the Oakland Education Association (OEA), said she was not surprised that the AIMS charter school withdrew its request for space at McClymonds. “They don’t want the grief of the resistance they will get from parents and the community. So they backed down,” she said.